The Top 14 (French pronunciation: ​) is a rugby union club competition that is played in France. The Top 14 is at the top of the national league system operated by the French National Rugby League, also known by its French initialism of LNR. There is promotion and relegation between the Top 14 and the next level down, the Rugby Pro D2. The fourteen best rugby teams in France participate in the competition, hence the name Top 14. The competition was previously known as the Top 16. The first ever final took place in 1892, between two Paris-based sides, Stade Français and Racing Club, with the latter becoming the inaugural champions. The competition has been held on an annual basis since, except from 1915 to 1919—because of World War I—and from 1940 to 1942—because of World War II. Toulouse is the most successful club in the competition with 19 titles. The first competition was held in 1892, as a one-off championship game between the Racing Club de France and Stade Français. The Racing Club defeated Stade Français four points to three to win the first ever title, though the stadistes got their revenge the following year in a repeat of the final. The match official for that first final was Pierre de Coubertin. Stade Français would go onto win a number of titles thereafter. The 1897 and 1898 series were awarded on a points system after a round-robin. Although the competition was called the French championship, entry was confined to Parisian clubs. The 1899 season was the first to include clubs from outside of Paris, and led to Stade Bordelais (from Bordeaux) winning the final that season, which was also played outside of Paris, in Le Bouscat (a suburb of the city of Bordeaux). For the following decade the championship game would usually end up being contested by the Racing Club, Stade Français and Stade Bordelais, with Stade Bordelais actually winning five titles during this period. During this time the final was usually held in various stadia around Paris with the exception of 1903 and 1909 where it was held in Toulouse, as SOE Toulouse and Stade Toulousain were finalists respectively. The competition was then won by a number of different clubs before World War I, with teams like FC Lyon, Stade Toulousain, Aviron Bayonnais and USA Perpignan claiming their first titles. Due to the war, operations were suspended for a number of years. In its place, a competition known as the Coupe de l'Espérance was held which consisted mostly of young boys who had not yet been drafted. The competition was held four times but is not normally considered a full championship. The normal competition returned for the 1920 season, and Stadoceste Tarbais became the first post-war champions, defeating the Racing Club in the final. During the 1920s Stade Toulousain would create its now famous rugby history, winning five championships during the decade. USA Perpignan would also win two championships (their 1925 final victory was actually a second match, as a previous final had ended in a nil-all draw). During the 1930s the championship game was held only in Bordeaux and Toulouse. The 1930 championship game won by Agen over US Quillan, was the first final to go into extra-time. It would also see Toulon and Lyon OU win their first championship games. During the latter part of the decade, RC Narbonne, CS Vienne and Perpignan all won titles, and Biarritz Olympique were champions in both 1935 and 1939. After the war the championship final returned to Paris, and was played at Parc des Princes for the next four seasons. The competition during the 1940s was won by a number of different teams, though Castres won in 1949, and then again in 1950. FC Lourdes would become a dominant club during the 1950s, winning five championships, and another in 1960. SU Agen would go onto win three titles during the 1960s as well. Lourdes were also the champions of the 1968 season, but due to the May 1968 events, the finale was played three weeks behind normal schedule. At the end of regulation time the score was tied at 6–6, and then 9–9 after extra-time. Lourdes were declared champions because they had scored two tries to Toulon’s none and also because it was impossible to reschedule a third final so late, as the French national team were to leave on a tour to New Zealand and South Africa. Although Béziers won their first championship in the 1961 season, it would be the 1970s which would see a golden era for the club, as they would win ten championships between 1971 and 1984, as well as being runners-up in 1976. Also in the mid 1970s, after being held in Toulouse, Lyon and Bordeaux in recent years, the championship final was taken to Parc des Princes on a permanent basis. During the rest of the 1980s, Toulouse were the dominant team, winning the championship in 1985, 1986 and 1989. Toulon won in 1987 (and were runners-up in 1985 and 1989), and Agen won in 1988 (and were runners-up in 1984 and 1986). The first match of the 1990s went into extra time, as the Racing Club defeated Agen, winning their first championship since 1959. CA Bordeaux-Bègles Gironde, Toulon, Castres and Toulouse would win the following finals. The 1990s also saw the game of rugby union go professional following the 1995 Rugby World Cup in South Africa. This also led to the establishment of the European Heineken Cup. Including their 1994 victory, Toulouse won four championships in succession. For the 1998 season, the final was moved to the newly constructed Stade de France, the new national stadium. The final, played in front of 78,000, saw Stade Français win their first championship since 1908. Top 14 logo used through the 2011–12 season. The competition saw an enormous rise in popularity in 2005–06, with attendance rising to an average of 9,600 up by 25% from 2004–05, and numerous sellouts. On 15 October 2005, Stade Français drew a crowd of 79,502 at Stade de France for their home match against Toulouse; this broke the previous French attendance record for a regular-season league match in any sport (including football) by over 20,000. That record was broken on 4 March 2006, when Stade Français drew 79,604 to a rematch of the 2004–05 final against Biarritz at Stade de France. It was broken again on 14 October 2006 with 79,619 as the same two opponents met, and a fourth time on 27 January 2007, with 79,741 for another Stade Français-Toulouse match. During the regular season 2010–2011, the average attendance per match reached 14,184. In 2011, Canal+ indicated that evening matches were being watched by 800,000–850,000 viewers while afternoon matches were watched by around 700,000 viewers. Over the recent years, the Top 14 has seen the economic strength of its clubs rise significantly. Helped with high attendances, large TV rights contracts, public subsidies and the rise of the euro exchange rate, Top 14 clubs have seen their overall spending budget increase significantly. In 2011–2012, 4 clubs had a budget over 20 million euros: Toulouse (33), Clermont (24), Racing Metro (22), Stade Francais (21). The average salary of players in the Top 14 were estimated to have risen, in 2010, to an average of $153,700 (to compare with $123,000 in the English Premiership). The wealth of the Top 14 clubs has led them to attract a large number of international players, and to build teams with more strength in depth (in 2011, Top 14 clubs could have as many as 45 players to compare with 33 for Leicester Tigers, 2010 Premiership winner). Two recent changes in regulation may somewhat limit this economic growth. First, the French government repealed the law known as DIC (Droit à l'Image Collectif) the 1 July 2010. This law, allowed all member clubs in French professional sports organisations to treat 30% of each player's salary as image rights. This portion of player salaries was thus exempt from France's high payroll and social insurance taxes. Second, to control the growth of club spending, the LNR introduced a salary cap in the Top 14 in the 2010–11 season. Under the provisions of the cap, team payrolls was limited to €8 million. This is in addition to an existing requirement that wage bills be no more than 50% of a team's turnover. However, the €8 million cap was only 5% greater than the highest official wage bill in the 2009–10 Top 14, and translated to £7.1 million at the time the cap was announced, well above the English Premiership's then-current £4 million cap. For the season 2011–2012, the LNR raised the salary cap to €8.7 million. Since then, the cap has risen still further, to €10 million starting in 2013–14 and continuing through 2015–16. Additionally, the cap now excludes youth players whose salaries are no more than €50,000. At the same time as LNR announced the salary cap, it also announced new rules requiring a minimum percentage of French players on club rosters. Original plans were to require 50% French players in 2010–11, but protests from leading clubs led to a reduction to 40% for that season. The 50% quota was to be met in 2011–12, and 60% in 2012–13. Qualifying players, referred to in French as JIFF (joueurs issus des filières de formation, loosely translated as "home-grown players"), must have been registered with the FFR for at least five years before turning 21, or have spent three seasons in an FFR-approved training centre if they are currently under 21. These regulations, however, do not consider eligibility to play for the French national team. For example, although the Armitage brothers (Delon, Steffon and Guy) have all represented England internationally, they qualify as JIFF because of their tenure in Nice's youth setup. On the other hand, recent France international Jérôme Thion, despite being a native and lifelong resident of France, did not qualify as JIFF because he switched from basketball to rugby too late in his youth. While the most visible critics of the change in policy were wealthy club owners such as Mourad Boudjellal of Toulon and Max Guazzini of Stade Français, concern had been growing in French rugby circles that some smaller clubs might fold completely. Bourgoin only avoided a bankruptcy filing in 2009 by players agreeing to large wage cuts, and Brive, whose 2009–10 wage bill was €7.2 million, announced that they would cut their budget by 40% for the 2010–11 season. Following the 2009–10 season, Bourgoin were denied a professional licence by LNR due to their ongoing financial issues, but the French Rugby Federation (FFR) reversed this decision on Bourgoin's appeal. Montauban were relegated at the end of the same season after filing for bankruptcy. Clermont and Toulon, who were set to play in the Heineken Cup final within days of Moriarty's piece, fielded a total of eight France-qualified starters out of a possible 30 in their Heineken Cup semifinal matches. Of these eight players, only four were regulars in the French national team. During the 2012–13 Top 14, none of the top three points scorers were French, and only three of the top 10 try scorers were French. Of the players who made the most appearances in their respective positions during that season, only three (out of 15) were French. National team coach Philippe Saint-André suggested that several "foreign" players—meaning players who were born and largely developed outside the country—could make their debuts for France during the team's 2013 summer tour. Moriarty specifically named five such players as potential Test newcomers. The Top 14 is contested by fourteen professional rugby union clubs throughout France. The domestic season runs from August through to June. Every club contests 26 games during the regular season – over 26 rounds of competition. The season is split into two halves for scheduling purposes; both halves are scheduled in the same order, with the team at home in the first half of the season on the road in the second. Throughout the August–June competition there are breaks during the season, as there are also European club fixtures (from 2014–15, Champions Cup and Challenge Cup) that are played during the rugby season, as well as the Six Nations Championship, in which many top French players are involved, as well as a few players from the other European powers. The schedule may be adjusted somewhat in World Cup years; this was especially true in the 2007–08 season, which ran up against the 2007 Rugby World Cup in France. That season, the Top 14 played on all of the Six Nations weekends and on some of the Heineken Cup weekends. The Top 14 is organized by the Ligue Nationale de Rugby (LNR), which runs the professional rugby leagues within France (Top 14 and Rugby Pro D2). There exists a promotion and relegation system between the Top 14 and Pro D2. The two lowest placed clubs on the ladder after the regular season are relegated to Pro D2, while two clubs come up from Pro D2, specifically the champion and the winner of a knock-out playoff between the next four teams on the ladder. Starting with the 2009–10 season, the Top 14 knock-out stages consist of three rounds. The teams finishing third through to sixth on the ladder play quarter-finals, hosted by the No. 3 and No. 4 teams. The winners then face the top two seeds in the semi-finals, whose winners then meet in the final at Stade de France (although the 2016 final will be held at Camp Nou in Barcelona due to conflict with France's hosting of UEFA Euro 2016). In previous seasons, only the top four teams qualified for semi-finals. Unlike many other major rugby competitions (such as the Aviva Premiership, ITM Cup, Currie Cup, and from 2009–10 the Celtic League/Pro12), the Top 14 has traditionally held its semi-finals at neutral sites. Regardless of the playoff format, the top six teams had qualified for the following season's Heineken Cup in the final years of that competition, and since 2013–14 a minimum of six teams qualify for the European Rugby Champions Cup. Before the 2009–10 season, the seventh-place team also qualified if a French club advanced farther in that season's Heineken Cup than any team from England or Italy. While the European qualification system was changed for 2009–10, the normal contingent of six Top 14 teams in the Heineken Cup did not change. The default number of French teams in the Champions Cup has remained at six, but the method for a seventh French team to qualify has changed from performance in the previous European season to a post-season playoff. For the inaugural Champions Cup in 2014–15, this playoff involved the seventh-place teams from both England and the Top 14; in future years, the same two sides will be joined by one Pro12 side. Previously in the first phase of the then-Top 16, the teams were divided into two pools of eight. This was followed by a second phase, in which the eight highest-ranked teams played for semi-final spots and the bottom eight teams battled against relegation. In 2004–05, the top division consisted of a single pool of 16 teams, with the top four teams advancing to a knockout playoff at the end of the season to determine the champion. From 2005–06 through 2008–09, the top division was run with a single pool of 14 teams, again with a season-ending four-team playoff. The single pool was retained for 2009–10, but the playoffs were expanded to six teams. For 2014–15, LNR further tweaked its bonus point system. The margin of defeat that allows the losing team to earn a bonus point was reduced from 7 points to 5. The Top 14 serves as the qualification route for French clubs in European club competition. Starting with the 2014–15 season, Top 14 teams compete in the new European club rugby competitions—the European Rugby Champions Cup and European Rugby Challenge Cup. The Champions Cup and Challenge Cup replaced the previous European competitions, the Heineken Cup and Amlin Challenge Cup. Under the new structure, the top six teams on the Top 14 table qualify directly for the following season's Champions Cup. The seventh-placed team advances to a play-off for another Champions Cup place. In 2013–14, the play-off involved said Top 14 club and the seventh-placed club in the English Premiership. Initially, plans were for the play-off in subsequent years to also include two sides from Pro12 in the Celtic nations and Italy. Due to fixture clashes with the Top 14 season, the play-off that will follow the 2014–15 season will involve only one Pro12 side. In the Heineken Cup era, a minimum of six French clubs qualified for the Heineken Cup, with the possibility of a seventh depending on the performance of French clubs in the prior season's Heineken Cup and Challenge Cup. All Top 14 clubs that do not qualify for the Champions Cup automatically qualify for the Challenge Cup. This means that all Top 14 clubs will participate in European competition during a given season. The French clubs have had huge success in the European competitions. The inaugural Heineken Cup, held in the 1995–96 season, was won by Toulouse, which would eventually claim three more championships (2003, 2005 and 2010). It would also not be until the fifth championship game until there was no French team in the final. In addition, there have also been five occasions where the final was an all-French encounter. The first three were all won by Toulouse (against Perpignan in 2003, Stade Français in 2005, and Biarritz in 2010); the other two were victories by Toulon over Clermont in 2013 and 2015. In addition to the French success in the Heineken Cup and Champions Cup, the clubs in the lower European competitions have achieved similar results. 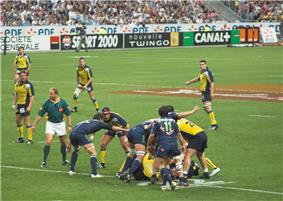 The first four finals of the European Challenge Cup (1997–2000) were all-French affairs. Since then, however, only two French clubs (Clermont in 2007 and Biarritz in 2012) have won this competition, and French clubs in general have had less success; the revised Top 16/Top 14 format has required them to pay more attention to league games in order to avoid relegation. The now defunct European Shield, a repechage tournament for clubs knocked out in the first round of the Challenge Cup that was played for three seasons from 2003–05, was won by a French team each time. ^ Since 2012–13, Bordeaux Bègles have played most of their home matches at the larger Stade Chaban-Delmas instead of their traditional home of Stade André Moga. ^ In recent years, Racing has taken occasional home matches to Stade de France, MMArena in Le Mans, and Stade Océane in Le Havre. ^ Toulouse often takes high-demand home matches to the city's largest sporting venue, Stadium Municipal. The 2015–16 season is the first since 2013 in which that stadium has been available due to major renovations for UEFA Euro 2016. Yellow background (row 7) indicates the team that may qualify for the 2016–17 European Rugby Champions Cup. To facilitate the 2015 Rugby World Cup, there will be no play-offs for the Champions Cup with the 20th place going to the winner of the 2015–16 European Rugby Challenge Cup if not already qualified. Since the 2008-09 season, the Top 14 regular season and playoff quarter finals and playoff semi finals have been televised by Canal+. Between the 2008-09 season and the 2010-11 season, France Télévisions televised the playoff final but since 2011-12 season they and Canal+ jointly televised the playoff final. The scores in green are links to the account of each final on the site of the professional league (LNR). In French. ^ The 2016 final was moved to Barcelona as the final collided with UEFA Euro 2016, and therefore no stadium with sufficient capacity was available to host the final in France. Accordingly, LNR chose Camp Nou as the venue. ^ a b "Brennus, les 26 clubs sacrés !" (in French). ^ LNR. "Statistiques generales 2010–2011" (in French). ^ Belsoeur, Camille (11 05, 2011). "Droits TV: comment Canal+ a recadré le rugby français". ^ Raveney, Chris (11 May 2011). "Canal Plus retains Top 14 with multi-million dollar deal". sportspromedia.com. ^ Cleary, Mick (10 February 2009). "Top English rugby talent lured by Euro". The Daily Telegraph. Retrieved 2011-11-04. ^ Renaud (16 August 2011). "Toulouse toujours le plus gros budget du Top 14" (in French). rencontresaxv.fr. ^ Crumley, Bruce (16 May 2010). "Gloom over French Soccer Contrasts With Rugby's Rise". Time. ^ Dearlove, Paul (22 November 2010). "Paul Dearlove column: Up to 50 foreign stars could be heading to Top 14 for next season". frenchrugbyclub.com. ^ Clegg, Jonathan (14 January 2011). "French Rugby Rules Europe". The Wall Street Journal. ^ a b Moriarty, Ian (2009-11-11). "French rugby heading for crisis". Scrum.com. Retrieved 2009-11-12. ^ a b "Top 14 set for salary cap". Scrum.com. 2009-12-17. Retrieved 2009-12-19. ^ Moriarty, Ian (2009-12-18). "Salary cap just sleight of hand". Scrum.com. Retrieved 2009-12-19. ^ "Salary cap up to €8.7m". frenchrugbyclub.com. 2011-03-22. Retrieved 2011-11-04. ^ "French rugby chiefs agree salary cap rise". ESPN Scrum. 2013-04-17. Retrieved 2013-08-21. ^ Eddison, Paul (2013-12-04). "Rugby's uncordiale entente". ESPN Scrum. Retrieved 2015-04-28. ^ "Bourgoin maintenu en Top 14" (in French). 2010-07-09. Retrieved 2010-07-09. ^ Moriarty, Ian (2010-07-06). "Time to hit the panic button?". Scrum.com. Retrieved 2010-07-06. ^ Moriarty, Ian (2013-05-15). "The multi-national tricolour". ESPN Scrum. Retrieved 2013-05-17. ^ a b c "Future of European Rugby resolved" (Press release). Rugby Football Union. 10 April 2014. Retrieved 10 April 2014. ^ Jones, Chris (24 September 2014). "Rugby Union: Change to Champions Cup play-offs". BBC Radio 5 Live (BBC Sport). Retrieved 24 October 2014. ^ "Abonnement saison complète 2013-2014" (in French). www.ubbrugby.com. Retrieved 11 June 2013. ^ "ABONNEMENTS SAISON 2013-2014" (in French). www.fcgrugby.com. Retrieved 11 June 2013. ^ The title was awarded after a round-robin with 5 clubs. Stade Français won with 10 points, Olympique de Paris was second with 8. ^ The title was awarded after a round-robin with 6 clubs. Stade Français won with 10 points, Racing was second with 6. ^ The first time provincial teams were invited. ^ In 1901, Stade Bordelais won the final 3–0. But the U.S.F.S.A. which organized the competition cancelled the result and ordered a replay in Paris, as Stade Bordelais had fielded three ineligible players. But the Bordeaux side refused the replay and Stade Français were declared the winners. ^ A first final, played on 26 April 1925 in Toulouse, had ended on a 0–0 a.e.t..
^ A first final played on 15 May 1949 at Stade des Ponts Jumeaux in Toulouse had ended on a 3–3 draw (a.e.t.). ^ Because of the May 1968 events, the finale was played three weeks behind the normal schedule. At the end of regulation the score was 6–6, and 9–9 after extra-time. FC Lourdes were declared champions because they had scored 2 tries to Toulon’s 0 and also because it was impossible to reschedule a third final so late, as France were to leave on a tour to New Zealand and South Africa. ^ Béziers won 3 goal-kicks to 1. ^ The highest scoring final ever. ^ "Top 14 Finale : Clermont-Auvergne – Toulouse". L'Équipe (in French). 2008-06-24. Retrieved 2009-04-01. ^ "Top 14 Finale : Perpignan – Clermont". L'Équipe (in French). 2009-06-06. Retrieved 2009-06-06. ^ "Top 14 Finale : Perpignan – Clermont". L'Équipe (in French). 2010-05-29. Retrieved 2010-05-29. ^ "Top 14 Finale : Toulouse – Montpellier". 'L'Équipe (in French). 2011-06-04. Retrieved 2011-06-10. ^ "Castres, vingt ans après". 'L'Équipe (in French). 2013-06-01. Retrieved 2013-06-02. ^ "Toulon 18 – 10 Castres". ^ "Stade Français - Clermont (12-6)". L'Équipe. 13 June 2015. Retrieved 13 June 2015.